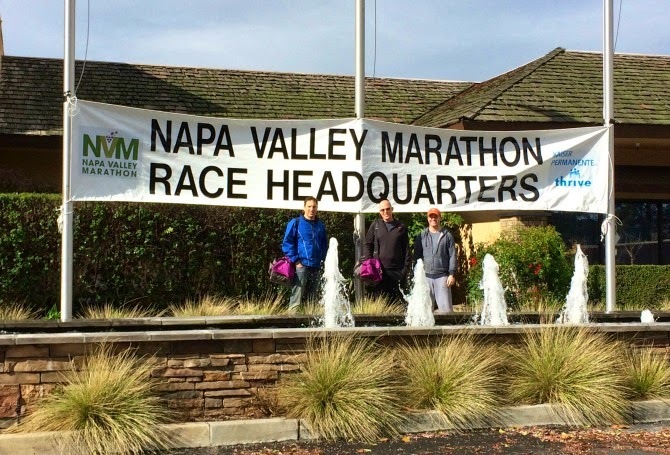 On Friday, February 28 we traveled to Napa with 39 runners (and associated plus ones) for the Napa Valley Marathon. 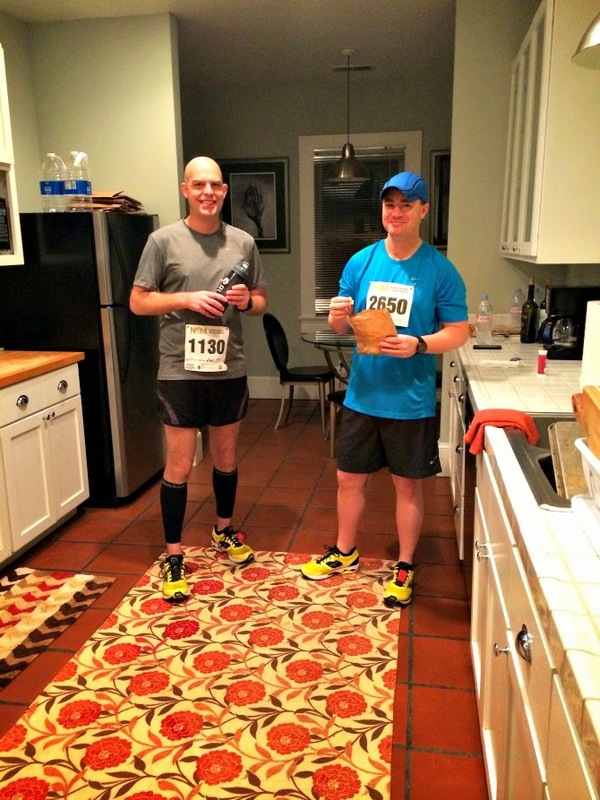 Each year our running group, Gilbert's Gazelles, chooses a few destination marathons. For obvious reasons, a good number of people were interested in this particular destination. For all of the months of training leading up to the trip, the excitement continued to build. Hank and friends racked up some serious miles on their feet and developed a great camaraderie among their training group. Meanwhile, I racked up some serious empty bottles in our recycling bin. Onward to Napa! The weather forecast wasn't great, but the cooler temps and drizzle could have been much worse. After settling into our adorable rented house (that we shared with a few friends), the guys hit the store for some groceries and we settled in for a good night's sleep. Early Saturday a good majority of the runners got together for a warm-up at the track, followed by the beginning of their Aussie Carb-Loading ritual (basically run like crazy for 3 minutes, and then begin consuming an insane amount of carbs, continuing throughout the day). While the marathoners were doing their thing, I laced up my shoes and went out for a 3 mile run- taking advantage of having a house just 1 mile from downtown Napa. I loved getting a feel for the neighborhood on my feet. After the track workout, a group of about 20 met at a family-owned restaurant Oventi for breakfast. They continued their carb loading with Fig Newtons, and huge plates of pancakes. The goal is to consume up to 850 grams of carbs (less for smaller girls), and the thought of that just makes my stomach churn. But they plugged through and finished cleaning their plates. 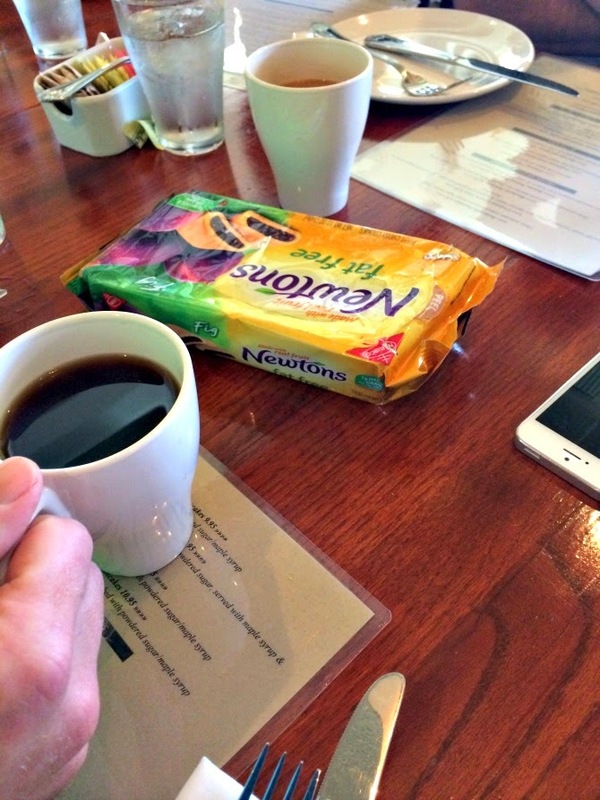 How about some Fig Newtons with those pancakes? After breakfast (and showers), we headed to the expo so the runners could pick up their race swag, and then we drove the course with our friends and housemates Keith and Craig. 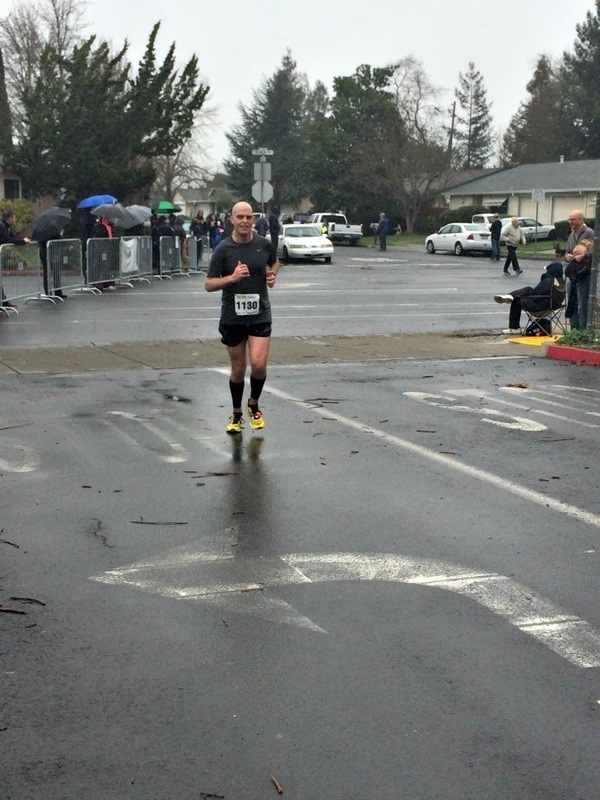 The race starts in Calistoga, and heads south on the Silverado Trail into Napa. From the car, the hills didn't seem like much. But there were a lot of twists and turns in the road, and plenty of gorgeous scenery. Craig, Hank and Keith showing off their awesome bags. After a busy morning, the guys were due for a nap, and I was ready to get out and about. 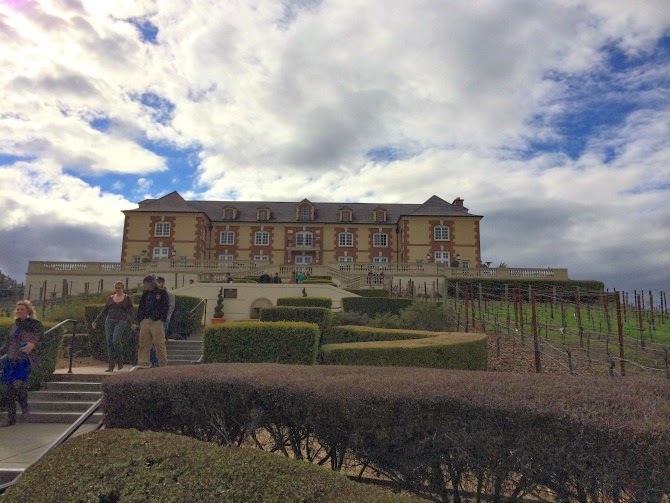 Another runner's girlfriend expressed interest in getting some bubbly that afternoon, so she picked me up and we headed over to Domaine Carneros. We got there just in time to catch their 3pm tour, and learned some interesting things while viewing parts of the property. Of course my favorite part involved tasting. They are known for their sparkling wines (the Brut Rosé is my favorite), but I was surprised to learn that they make Pinot Noir as well. I left with a bottle of each! Once back at the house, I worked on making a Gazelle Family Dinner for a few friends. We had salad, pasta, and baguette slices. A glass of wine for the ladies, and plenty of water for the men. It was a fun, relaxing way to enjoy an early dinner with friends. 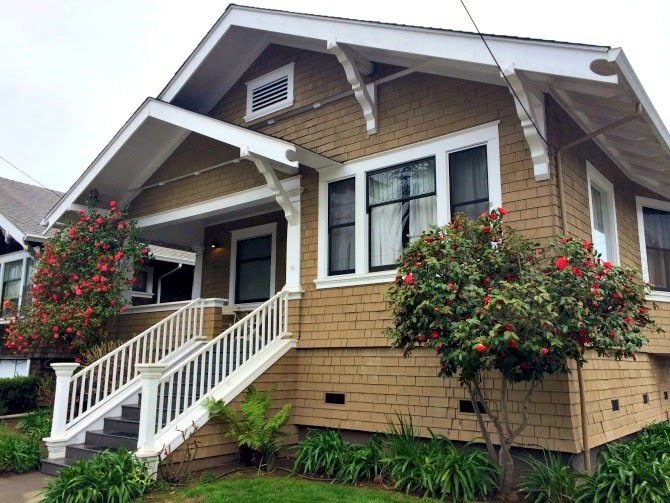 I loved having a "home base", and am really glad that we used VRBO to rent a house. We will definitely go that route again, and I highly recommend the 3 bed/3bath house that we stayed at. Fast forward to Sunday morning- RACE DAY!! The guys were up bright and early, making one last check that they had all their stuff. One of their coaches picked the guys up early so they could meet the bus to Calistoga. I tried to go back to sleep, but was way too excited and nervous for them. Plus- I was running the 5K that morning, and had to pick up another wife, Laura, who was running with me. There were only about 250 people who ran the 5K, and I really enjoyed the smaller environment and super flat course. I was proud to clock my fastest time in 3 years, finishing the race in exactly 28 minutes! After we finished, Laura and I hopped in the car and raced to the 16 mile marker, hoping to see the Gazelles run by. I was kicking myself for signing up for a race, since I have never actually gotten to watch Hank at a marathon. I really didn't want to miss him coming by. But luckily we made it to the trail with a few minutes to spare, and saw the first Gazelle, Eric, running by. We knew he would be first, and were so glad that we hadn't missed our guys. Hank and Becky made their way by a few minutes later, followed by more familiar faces. The rain was starting to come down pretty steadily, and we did our best to cheer them all on. They all looked great, and it was so fun to see so many familiar faces. 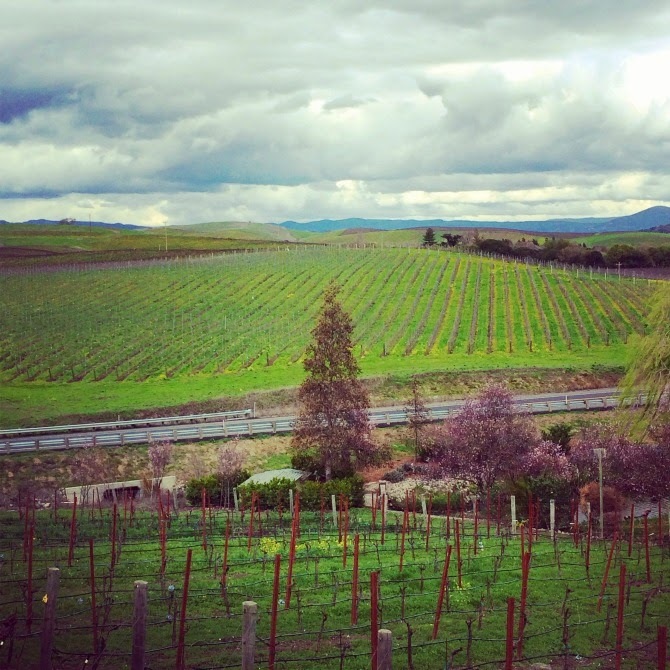 Not your typical marathon scenery...miles and miles of vineyards! After waiting around another 15 minutes or so, we knew we had to jog back to the car and get back to the finish line so that we could see them come in. Parking was going to be an issue, and it was still raining, so we tried to hurry. 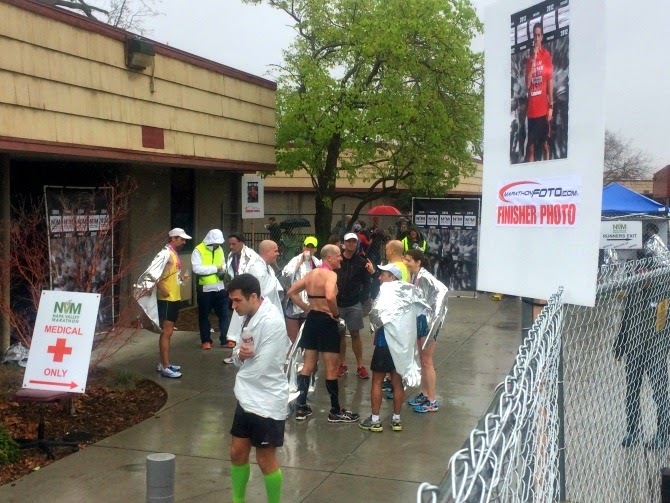 By the time we made it to the finish line, the rain was really coming down and I felt so bad for the runners. But we yelled and cheered and had so much fun watching all of these amazing runners finish the race. Gazelles started arriving, and I finally saw Hank coming down the finishing chute. He looked tired, but was still smiling, and I was so happy to be there watching him finish. I just can't even imagine (nor do I ever want to feel) how a marathon wreaks havoc on your body. I was so, so proud of him!! I met him on the other side of the finish and hung around while the guys changed, drank their recovery drinks, and traded stories from their race. It's such a close group of runners, and I love watching their interactions. They also happen to be highly competitive, and it didn't take long for them to start getting reports of how some of the friends performed in races back in Austin that morning. After getting cleaned up and seeing most of the other Gazelle's finish, it was time to head back to the house to shower and get ready for part 2 or our trip- The Tasting Part! Very cool - what a fun trip. You had such a variety of things to do!! I've never been to CA, but hope to go some day!